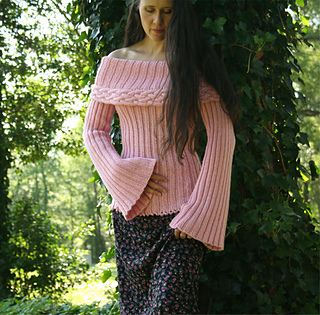 XS [S, M, L, 1X, 2X, 3X] (shown in size S) To Fit Bust 30 [34, 38, 42, 46, 50, 54]"
The body of this easy top down sweater is knitted seamlessly in 2x2 ribbing with 2x2 ribbed sleeves and a beautiful, but easy cable added to the fold down collar for stunning effect. Simple picot edging adds a feminine touch to the hem. 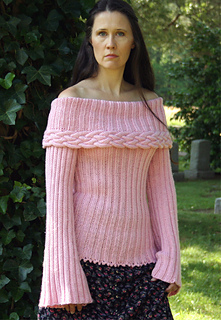 Perfect for beginner knitters, the sweater is worked from the top down in the round. Stitches are divided for armholes and worked flat, then rejoined to continue to hem in the round. 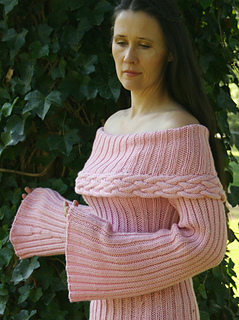 The cable is knitted separately to ensure it fits properly around shoulders. Then it is attached to collar of garment. Due to the elastic nature of the ribbing, the “To Fit” size includes 2-3 inches of negative ease. The ribbed fabric is very forgiving and flattering for many body shapes.